Today the mail brought the summer issue of American Lutherie magazine, and to my surprise at the cover photo is a close up of my Signature Model. Last year Cyndy Burton conducted a fun interview with me, and how-bout-that, there it is in print. There are some funny pix of me as a youthful person, and other important people, and a certain amount of spouting off on my part about the past present and future of the guitar in my world. I'm flattered and grateful that Cyndy and the staff of the Guild of American Luthiers put their efforts into this article. They did a great job. This magazine is an excellent publication. It's the most constant presence of the GAL, and well worth the membership price. 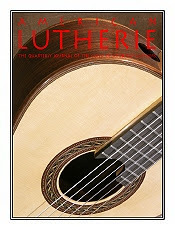 If you like guitars and guitar making I recommend that you subscribe - http://www.luth.org/ . At the moment they'll even throw in a copy of issues #89 and #90, which is the one with my feature article. There is lots of other interesting stuff as well.